While Seattle may have been hit with a some cooler weather that doesn't mean summer is over. Meadow is full of new beautiful flowing dresses, cool, light fabrics and perfect patterns to keep our summer going! Stop by this weekend and see all the great newness while enjoying the beautiful weather! Black floral pattern maxi wrap dress with tie waist. Blue multi pattern midi dress with tie waist accent. Mustard yellow long sleeve top paired with new Kancan high waist denim. Grey and black stripe mini dress with side cinch detail. Navy triangle pattern wrap mini dress with ruffle hem. Brick color midi dress with fly away sleeve and knot detail on front. Caramel and Black long sleeve collar top with high-low hem. 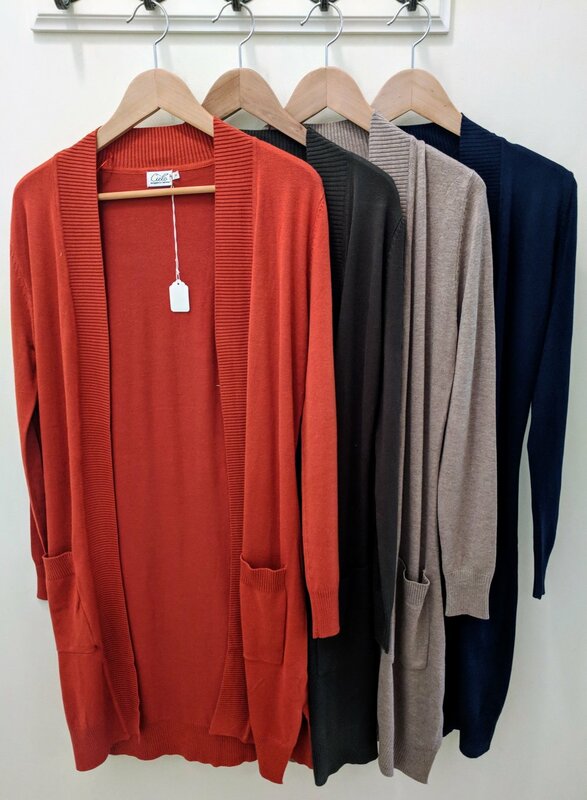 Rust, Olive, Camel, and Navy long open front cardigan with front pocket. Pale Mauve short bell sleeve top with wrap and tie detail on back paired with new Kancan high waist distress skinny denim. Blue pattern maxi smock dress with tie neck and 3/4 sleeve.